Yes today I sorted out my Big Fat Greek Photo Gallery on my other website Photos of Santorini using the FooGallery Wordpress plug-in. This is what my website Photos of Santorini looks like! It has taken a while, and longer than anticipated, but Photos of Santorini is now complete. This website has been built entirely by me using the Wordpress platform. All the words and images are my own. And it took me about a year and a half longer than I anticiapted to actually do something with the photos I took when I visited the wonderful Greek Island of Santorini. I didn’t expect to be creating a brand new website, but this is what I have done! So for now, I am going to sit back and have a break before getting on with my next website Paxos Travel Guide! Sound like a a gardening theme this one! Anyway another job done on my website Photos of Santorini. I have to say that I have found creating a Wordpress website a complete revelation - this last piece of work was an absolute doddle. All I needed to do was go to the Snippet Preview at the bottom of the page and type in the text - the boxes went to green when there was the right amount of text, and if I put too much text then the bar went red! And with that I am done for now. Photos of Santorini is complete. My intention was to get this done asap and for it to not be a polished website. So with that I am going to reminded the pages of the website, take advice on the ideal theme for this website and moe on to the next thing. Following my experiences with this website I do not expect to complete my next website this side of Christmas, as this is following the Project 24 format strictly. I will get back to this next week, leaving me a bit of time to sort some other stuff. Priority job number one for my website photos of Santorini was to swap over the images one the blog posts for images with the completed metadata. And while I was at it I have deleted all the images that I uploaded previously to avoid future confusion! Why are some excellent Lightroom tools not replicated in Photoshop? I am sat here editing my photos of Santorini. Nearly done which is good. I have been going into Photoshop to remove primarily sensor dust spots, but also stuff creeping into the edge of a shot, and also stuff I want removing. Take this photo of Fira for example - there are all sorts of bits that need consigning to the shadows as they don’t add to the image - they just distract. This is the final image. I do this work in Photoshop and then save the image back into Lightroom. I then have to go back to the Spot Removal Tool in Lightroom to check to see if there are any bits left that I have not done - there is an excellent feature called Visualise Spos bottom left after you select the (much improved) Spot Removal Tool. This is the spots that required removal after the work I have done in Photoshop - quite surprising! The small circle are spots that I have removed. The question is this - why is the excellent Visualise Spots feature not available in Photoshop? And while I am on the subject why cannot I not use the Page Down key to navigate through an image like I can in Lightroom? There are some execllent features in Lightroom thaht would make Photoshop so much easier to use. What is the best website for photos of Santorini? 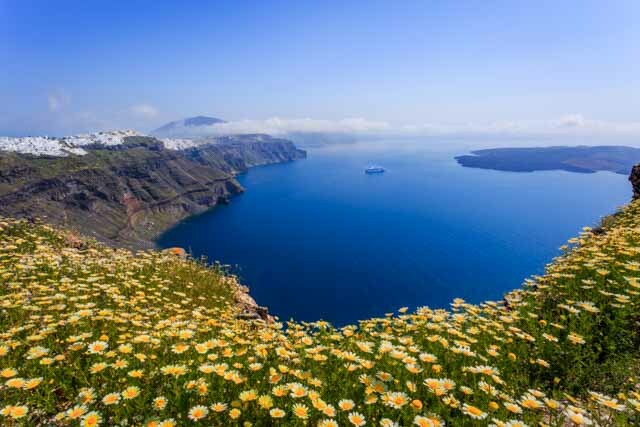 There are many websites which have lots of great photos taken on the wonderful Greek Island of Santorini. But what is the best website for photos of Santorini? Well my brand new website Photos of Santorini of course! This is certainly the best website called with this name, and cunningly my website has that as it’s URL. ﻿I know – a grand statement but let’s be honest – if I don’t blow my own trumpet who will? And in time the search term “best website for photos of Santorini” will hopefully bring people right here to this post, which will take visitors over to my brand new website. This is all part of a plan! This is my first bespoke travel photography website. I went to Santorini last April on a photography trip. And when I came back I went through my photos and had over 100 images that I would display on my website and feel comfortable selling commercially. That was quite a remarkable return for a 5 day photography trip, so good was the location. That and the fact that I had five solid days taking photos. My problem was this - what do I do with the photos? This has been troubling me for some time now. I have all these photos, but what do I do with them? I seem to have taken lots of photos but never cracked what I do with them. What about stock photography selling? I have a few images on Adobe Stock, and had sold quite a few of these images. The problem is that the most I have got for an image is 25p. Yes 25p. And I have not sold enough images to get to a big enough earning amount to actually get paid by Adobe. The same happened with Shutterstock, with the same paltry financial return. I therefore decided some time ago that stock photography is just not for me – there must be a better way. I am not selling my work for a pittance. I spent some time thinking about this, processing my chosen images and posting them on social media – I even had a Santorini Photos page on my website. But none of this did anything – these things were not the answer. I am not sure to be honest. I listen to various podcasts on photography, solo businesses, passive income and internet marketing. And cricket and football – I am not that sad thankfully. And the one idea that kept coming back to me was a standalone website for my Santorini photos. I had a lightbulb moment, and decided to go for it. So I need to make my own website – how did I do that? First thing was to buy a website domain. I settled on photosofsantorini.com, which I bought and registered and bought hosting for all for less that £50. Buying the website was the kickstart I needed – I had something to work with. What am I going to put on my website? The original plan was 50 photos on 50 blog posts with some supporting pages, but this got reduced in the end to 20 blog posts and 1 very long post. And that very long post is the one that hit the internet this afternoon. This website blog post is titled Santorini photography tips – this is what I have learned. This is pretty much a summary of my experiences of going on a photography trip to Santorini, my version of events from start to finish. As I said this is a long post, and is designed to be a standalone post that will help anyone who is thinking of going on a photography trip anywhere in a foreign location, but especially of course to Santorini. And having read this post and found it useful, hopefully people will check out the other pages on my website, and come back here to my main photography website. There are 20 images on 20 blog posts where I tell the story about each image. How did I decide on this composition? This to me is one of the most important questions. I try to describe what I was thinking when I was coming up with the composition. Where was the photo taken? Using the Maps Module in Lightroom I am able to show exactly where each photo was taken. What time of day was the photo taken? Just the time the photo was taken. And some other relevant nonsense. What photography gear did I use to get the shot? A list of the gear I used. What camera settings did I use? Having listed the gear, I thought it only fair to share the camera settings used to get each image capture. One interesting fact about the image. I have tried to come up with something interesting for each image, something that you would not know just by looking a the image. Is there a behind the scenes video of this shoot? Not for every shot, which is a great shame. But there are some behind the scenes videos and some photos taken on my iPhone. How did I process the image? This is a quick description of how I processed the image in Lightroom and Photoshop. I also share the settings in Lightroom by adding a screenshot from the Develop Module. What could I have done to improve the image? Very important to me is to critique all my own work to see if there are things that I need to correct, and learn what I could have done better. It is good to look back on images after the event. And what are my thoughts on this image? A general summary – does the image convey what I wanted it to convey? Is the photo a representation of that place and that time? Enough of me - what do you think of this image? 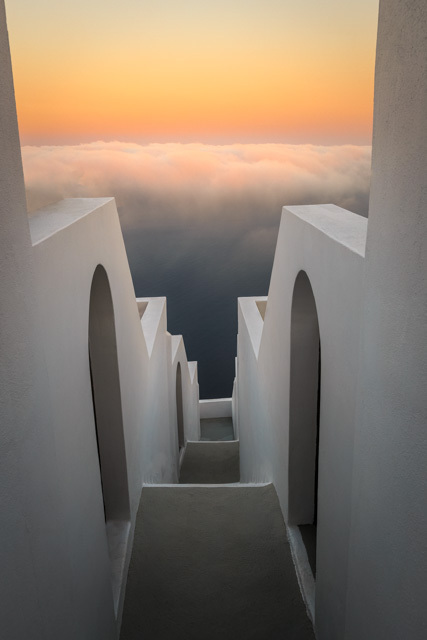 This is an interesting one – I have opened up this question to all visitors to my website – I can’t wait to see what people think of my photos of Santorini. I wanted a structure within which to write each web page, trying to cover all the angles that would be of interest to photographers. I wanted a consistency across the pages too. And let me tell you a secret – it is much easier to write stuff if you have a framework within which to write – 10 headings with circa 200 words per heading is a lot easier to write that 2000 words. I also have some static pages on this website. About me. A bit about me. Well why not? This is my own website after all. Blog. This is where the pages I have described above are. Those and some other pages I wrote when I first created this website. Contact. How to get in touch with me – very important for every web page to have this info. Do you want to buy one of my photos of Santorini? It took a while for me to realise the place to sell my photos is on my own website. And you can’t buy them anywhere else. Home page. Every website needs a home page and this my home page. Hmmm that’s clear now! My images of Santorini here in my big Greek photo gallery. This is all those images that I spoke about earlier. I have spent over a year looking for somewhere to put these photos, and on a single gallery page on my own website was just the place. There are just over 50 photos at the moment. I will add to this when I have finished editing all the photos I want to put on this website. This should be completed this week. My photography gear. A list of all my photography gear, along with a photo of the gear that I took to Santorini. What other work do I need to do to this website? Add links where I want them. Add my photo to each page (at the bottom). Just done that. And internal links to other pages. And finally index all the pages on Google. I should have said that this website has been created using the Wordpress platform. I bought the domain using GoDaddy, and I am using Bluehost for the hosting. All the photos are of course my own, and all the text has been written by me. So this is quite literally all my own work, which makes me feel almost proud. And at the time of writing I have not decided on the theme for the website - I have just gone with a free theme for now from which is called Pixgraphy - I have not got around to customising this yet. This is all new to me of course. How did I decide how long each post was going to be? I aimed for a minimum of 1200 words. 1200 words is probably the shortest I want blog posts to be to get good rankings in Google. This is a bit of an experiment, which hopefully being so niche will produce the results I want. The summary post is massive, and is based around the keyword that kept popping up when I was doing my research – Santorini photography tips. I want this page to rank number one on Google for the search term Santorini Photography Tips – lets see what happens – this post went live today (at 3.20pm) so this is an exciting thing for me to monitor. What is my website all about – who is it for? This website is all about the photos and the content. Photos of Santorini is a very specific niche subject. Santorini and my photos taken there. That is what it is all about and nothing else. 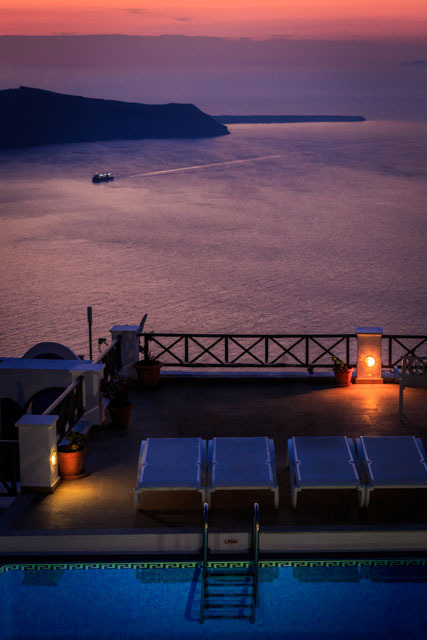 This website is not a Travel Guide to Santorini – and I not pretending that it is at all. Santorini and photography - this is all this website is all about. For a very specific reason. This is what I want to write about – these are my two favourite things to do – travel and photography. And my photos are unique to me – no one else has taken the photos I have taken in exactly the same way I did at exactly the same time. And my words about my photography are also unique to me. And that is the point – I have created a website which has to be unique as it is all my own work and I have never done this before. What next with this website? Wait. Wait for 4-6 months and see what happens. See if this is the beginning of my passive income, which will change my business model going forward. If this is successful I will be looking to create more websites following this model. And there is another website that I am going to work on next. This is my other travel photography website “Paxos Travel Guide”, which should be completed by the end of December 2018. This website is a bit more involved, and has a different structure and to be honest will take loads longer to create. There are lots more pages, lots more content, and there is another big difference with this website. I went to Paxos knowing that I would be creating this website, so have taken lots more photos, behind the scenes stuff and also a daily journal. This website will have probably double the amount of content that photos of Santorini has. And once this is done I hope to know if this website is a success before I start on my next website which will be about the wonderful Greek Island of Rhodes. This is part of the reason why I had to get my Photos of Santorini website out of the way – this is a smaller and every more niche website than Paxos Travel Guide. And I couldn’t concentrate on the other website until I had finished my work on my Santorini photos website. Summary – glad this is done finally. Now that this website is done I am very very happy. Let’s hope that this website is a success, and that I can make a different kind of living with my travel photography. That is my plan. I am looking forward to sitting back now all the hard work is done and seeing how this website performs. There are over 30,000 words and lots of images spread across the pages of this website – I will write a review in the New Year about progress and Google results. And what next? I need to get back to Paxos Travel Guide – two months of work with the completion of photos of Santorini done and there to inspire me. How is my new website Photos of Santorini going? My new website is going really well. For those who are new to my photography blog I have created a website called Photos of Santorini. I went to Santorini April 2017 and have been searching for a home and purpose for the photos I have created. And this website is that place. I am working on the core content, 20 pages with a decent amount of text about each image – one image per post. And once that is done there is one last page, which will have Santorini Photography Tips in the title somewhere. That is a seriously long post, well over 3000 words, which I have nearly finished adding to and drafting. And the point of the website? Oh yes and then there is the big change that I am going to make to the content. This thought appeared in my head yesterday. I had decided that I was going to have 20 photos only on this website, and write about them one by one. That I am still doing, but the website is called Photos of Santorini after all. And I nearly forgot that. What about all the other images? Are they going to stay on my hard drive, consigned to a life o no one seeing them? No. I have been making that mistake for far too long now. I am therefore going to add a gallery page with all the photos of Santorini that I have processed to date. I have agonised over the number of images that I was going to put on this website for far too long. So writing about 20 of them made sense. But adding all the images to a gallery makes even more sense. So that is what I am going to do. And as for the content on this website? I am hoping that this combination of pages will in time generate enough web traffic to provide some form of passive income to me. I am also hoping to sell the odd photo, but am not planning for this to happen. If this actually works I will have a template for other similar websites – now that is potentially very, very exciting indeed. This will open up huge future opportunities for me. Huge I say! This is my first website created from scratch in Wordpress. My main website is a template website, where I have just added stuff to a template.Not that there is anything wrong with that. And I have to say I have enjoyed creating a brand new website containing my work only – it has been a very enjoyable and satisfying process. And writing about my photos has also been very enjoyable too. When will this website be complete? I am aiming to be 100% complete by the end of October (2018). I am on track at the moment, and am now completely focussed on completing this job - finally. I have been desperate to do something with my photos of Santorini for 18 months now, ever since I got back from that fantastic trip there. And after that there is another website, similar but different. This website is called Paxos Travel Guide. This will take much longer to complete – I am hoping that this will be done by the end of 2018 – well that is what I am aiming for. That is a very ambitious target to be fair. And after that who knows? The clock will be ticking on both of these websites, which take some time to realise their full potential, if they have any that is! Keep checking back to my photography blog, which has weekly posts on a Monday afternoon and other posts as and when I have something to write about. Like now. Turns out I am anyway! I was thinking about this as I was working on my new website Photos of Santorini this morning. Rather than schedule posts I am going to write about stuff as I am doing it and not worry about formatting and all that dull stuff. This is actual me right now. 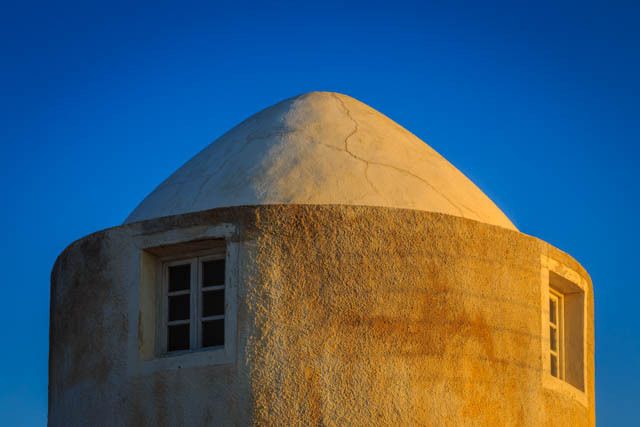 Back to my website - Photos of Santorini. I have the 20 images I want, and having added the metadata in Lightroom I have uploaded them all to draft posts. And I have just completed the exercise of adding titles to the posts. That means I am good to go with the writing of the 20 posts. And the one big post has been started and now has a working title. Titles frame what I write in each post - and I have to remember that I have Santorini in the URL! So my new website is now progressing to a plan which is good. Finally! Yes my favourite tool in Photoshop has to be the Patch Tool - this is the spot healing brush on steroids! I have just used it to sort out an extension to a sky caused by having to get the buildings straight meaning I had gaps around the edges! You can’t use the Patch Tool to add sky where there is none - in the first photo the white bits are blank - there is nothing there. So first I had to clone stamp bits of sky to fill in the gaps - once this was done then I could use the Patch Tool to improve the quality of sky infill. Magic. I am working on my Photos of Santorini website - more on this later in the week hopefully! What are my other websites? Photos of Santorini is one. I have two websites under development. Photos of Santorini is the first one. This website is very much a work in progress, and has been overtaken by the website I will mention tomorrow on my photography blog. photos of Santorini, Rick McEvoy ABIPP, What are my other websites? How am I going to complete my new website - Photos of Santorini? I did a list of things to do a couple of months ago, but had to put the new website back until September. And here is September 2018. So a refresh of that post is in order. And as I write this there is a late change in strategy following me thinking about this. I have decided that the content will be this. My best 20 pictures of Santorini in 20 blog posts. 10 posts about Santorini and my experiences of the island. And a gallery showing all the edited images. And I am just going to get on with it. In fact I wrote 2 posts yesterday which are on the website now. I am going to try to get this done in the first two weeks of September - lets see how I get on. Back to that original post. This is what I was going to do. "I am going to go through the images in my Lightroom Catalogue and see if there are any images that I did not select for the edit – I am now looking at these images with a different end in mind after all, so always good to have a quick look. I took 2442 images, which equate to 763 images once bracketed images have been put together. I selected 108 images to edit last year – lets see what I come up with this time." As far as I am concerned that is now down. I need to extract out the best 20 photos to write about. I am liking my new plan! Yes, I still need to do this – I keep closing the reminders when I fire up my PC in the morning, but I will behave and start with a freshly calibrated monitor. When I edit the images that is. "When I say edit the images I mean edit the images. Get all the images that I want to use fully edited. I started doing this over a year ago, but thankfully I can pick up where I left off just fine. To date I have edited 52 images. I will have circa 100 - 120 on the website, with the top 20 images being included in individual blog posts. And I have to say that I am rather excited to be getting on with the editing – I have upgraded the RAM in my PC, and Lightroom has received significant updates from Adobe since I last worked on these images, so image editing will be a more pleasurable experience." I am still excited to be doing this, although there is a time issue now as I have another two sets of images that I want to do even more with. I need to make sure that the metadata is correct, and to do this there is another job that I need to do. There is general metadata and very specific meta data - I expect I will do this for the top 20 images as I write the individual blog posts, and do the rest at the end. At the moment I am syncing images from Lightroom to my Wordpress website using an App - I need to review this as great as it is I am not sure about file sizes. I have started on this and the outcome of the research will drive the titles of the blog posts. Again, rather than writing about it I have just got stuck into it. But this is the biggest, and possibly most important job to be done. The website is live now on the internet with 53 images synced from a Lightroom collection, the pages added and four blog posts. Buy a theme. I have returned the theme so need to sort this again. I need to go back and see if there is anything else that I need to. I know that this is boring back of house stuff, but it is very important for a successful website. And still very important. SEO strategy - this is really all about the content - this is one of the main things I will spend time on. Yoast and other plug-ins. Done. I have just done the Yoast SEO set up which was a very simple job. Image upload – file sizes - to be determined but I need high quality images but file sizes that load quickly. Target audience and market. Hmmmm. One for a separate post. Google strategy - I think that is covered elsewhere. I have decided that I will be producing 20-30 blog posts/ pages on the website. For the posts talking about the photos I have taken I have come up with some headings. Do you want to buy this image? The website will then also be a useful resource about Santorini, and not just about my photos. I want a website that is of interest to people, and also helpful – this is not just about me trying to flog advertising and images. But not a definitive guide to Santorini. Oh no that is a different thing altogether. The plan has eveolved and changed. I am now just going to get on with it. I can always add/ delete stuff later if I need to. I have spent too long talking about this and just need to get on with it. The photos are just a time thing. That I have sorted so I can just get on with it. The hard work here is still the website itself – the technical stuff and the pages and content on each page. Once the website is done my plan is this – leave it. I will of course keep far too close an eye on the analytics, but to start with I am going to leave it for 6 months and see what happens. I will provide a monthly update on progress (or lack of progress). I have scheduled a blog post for the middle of October (was September) titled “How I built a WordPress website” which will be a useful guide for anyone else wanting to do what I am about to embark on. Obviously, the title might change but you get the idea.